currently under construction at 899 Queen Street East, Toronto. The development is scheduled for completion in 2019. 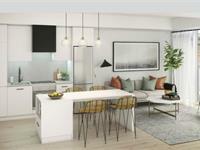 Sales for available units range in price from $599,900 to over $1,459,900. The Logan Residences has a total of 59 units. Sizes range from 611 to 1648 square feet. By Giovanni Tassone Architect Inc.
By City Life Realty Ltd. The Logan Residences is your connection to the energy and vitality that make Leslieville one of downtown Toronto’s most desirable neighbourhoods. With trendy restaurants and coffee shops, vibrant parks, eclectic local merchants, and convenient transit options, it’s no wonder Torontonians are eager to make this east end community their new home. 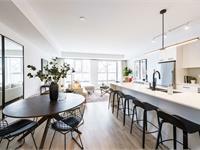 Fronting Queen at Logan, this new, six-storey, boutique residence by The Daniels Corporation carefully blends with the historic, village-like streetscape cherished by the residents of and visitors to Leslieville. Whether you’re an urban professional, young couple, growing family, empty nester, or anything in between, we know you’ll find yourself at HOME at THE LOGAN. - Approximately 9 ft. ceiling heights in principal rooms, defined as Living Rooms and Dining Rooms. Where bulkheads or dropped ceilings are required, the height of the ceiling will be less than 9 ft.
- Ground Floor Laneway Suites will have approximately 10 ft. ceiling heights in principal rooms, defined as Living Rooms and Dining Rooms. Where bulkheads or dropped ceilings are required, the height of the ceiling will be less than 10 ft.
- All measurements are calculated from the finished concrete slab floor to the underside of the concrete slab or finished ceiling above. - Suites to have solid core entry door with custom surround. Door to have painted finish and matte black lever hardware. - Contemporary 4” baseboards in all areas except Bathroom(s) and Laundry Room, which have a tile baseboard. - Contemporary 2” casings throughout. - Flat panel interior doors with satin nickel lever hardware. Framed glass sliding closet doors in Foyer and in Bedroom(s), as per plan. - Internal Bedroom to have clear glass doors and/or partitions in black frame, as per plan. - Interior walls primed and painted in latex flat finish warm-white paint; Kitchen, Bathroom(s) and Laundry/Storage to be painted in latex semi-gloss warm-white paint. Latex semi-gloss warm-white paint on trim. All paint is low VOC. - Underside of raw concrete slab ceiling painted white. Smooth, white drywall ceilings where bulkheads or dropped ceilings exist. - In-suite Storage Room, as per plan. - Poured concrete finish to all Balconies; Terraces to receive concrete patio pavers; finished underside to all Balconies. 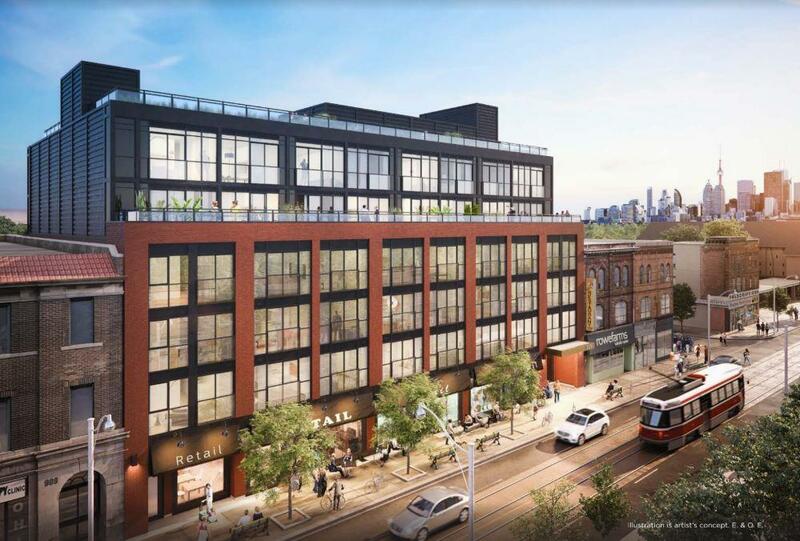 - Ground Floor Laneway Suites and Urban Two-Storey Suites to receive a barbeque gas line. - Ground Floor Laneway Suites and Urban Two-Storey Suites to receive an exterior hose bib. - Urban Two-Storey Suites to receive wood staircase (stained oak stair treads) with painted risers and stringers. Wrought iron pickets with contemporary posts and handrail painted black. - Laminate flooring in the Foyer and Foyer Closet, Hallway, Bedroom(s), Living/Dining Room, Den/Media, Kitchen and Storage Room, as per plan. - Small format, mosaic floor tile in Bathroom(s). - Ceramic floor tile in Laundry. 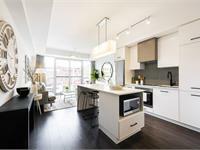 - Custom-designed contemporary kitchen cabinetry, with integrated under-cabinet valance lighting and soft-close hardware. - Quartz countertop with single bowl stainless steel, under-mount sink. Model types 2B+D, 3B and 3B+D to have double bowl stainless steel, under-mount sink. - Matching kitchen island with quartz countertop and dining accommodations, as per plan. - Matte black kitchen faucet with pullout head for ease of use. - Contemporary mosaic tile backsplash. - Model types 1B, 1B+D and 2B to receive European-style stainless-steel 24” oven and 24” refrigerator with bottom-mount freezer. In addition, these models will receive 24” electric cooktop with built-in hood fan, vented to exterior, 24” panelized dishwasher and microwave provided, as per plan. - Model types 2B+D, 3B and 3B+D to receive European-style stainless-steel 30” oven and 30” refrigerator with bottom-mount freezer. In addition, these models will receive 30” electric cooktop with built-in hood fan, vented to exterior, 24” panelized dishwasher and microwave provided, as per plan. - Contemporary track light fixture. - Custom-designed bathroom vanity with Quartz countertop, under-mount sink(s) and framed mirror(s). - All Bathrooms to have wall sconce at vanity. Pot light within the tub/shower. - Contemporary single-lever chrome faucet. - Acrylic deep soaker tub and wall tile surround up to ceiling. - Clear tempered glass shower stalls, with pre-formed base and wall tile surround up to ceiling, as per plan. 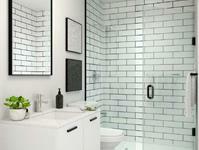 Ground Floor Laneway Suites and Urban Two-Storey Suites to include tiled shower base in Ensuite Bathroom. - Matte black bathroom accessories, including towel bar or ring, and toilet paper holder. - Exhaust fan vented to the exterior through Energy Recovery Ventilator. - Stacked or side-by-side white washer/dryer combination, vented to the exterior, as per plan. - Suite natural gas individually metered based on occupant consumption. - Suite air tempering via high velocity air handler system with suite cooling handled by individual air conditioning condenser. - Suite hydro individually metered using “Smart Meter” technology. - Individual service panel with circuit breakers. - Pre-wired outlets for telephone and/or internet connections in Living Room, Bedroom(s) and Den/Media, as per plan. - Pre-wired outlets for television and/or internet connections in Living Room, Bedroom(s) and Den/Media, as per plan. - Energy-effcient ceiling light fixtures provided in Foyer, Bedroom(s), Den/Media, and Laundry/Storage, as per plan. - Capped ceiling outlet in Living Room or Dining Room, as per plan. Switch controlled outlet provided in Living Room. - Capped ceiling outlet at kitchen island or peninsula, as per plan. - All appliances installed and ready to use. - White decora-style switches and receptacles throughout. 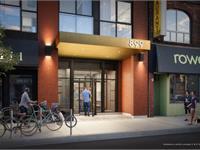 - Ground Floor Laneway Suites and Urban Two-Storey Suites to receive exterior light fixture. - Camera at Lobby entrance, allowing for in-suite viewing through cable television. - Enter-phone at Lobby to facilitate visitor access. - Resident key fob access throughout all Common Areas. - Convenient underground parking with cameras at pre-selected locations, along with two-way voice communication to monitoring station. - Suite entry door(s) to have rough-in for keypad and door contact for intrusion alarm system. Ground Floor Laneway Suites to have rough-in for keypad at exterior door. - Rough-in intrusion contacts on windows provided for Ground Floor Laneway Suites and Urban Two-Storey Suites. - Rooftop terrace units will receive one light fixture, one barbeque gas line, one hose bib, and one receptacle, in locations determined by the Vendor. 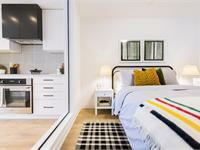 - The partitions separating the Rooftop Terrace Units will be tempered glass. One gated tempered glass entry door will be provided. 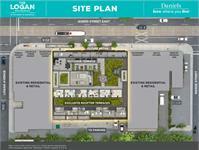 - Rooftop terrace units will receive concrete patio pavers. Your inquiry will be delivered to the The Logan Residences sales team, who will send you more information about this development.